[Almond] Joy to the World! My memories of Christmas are mostly about the cookies mom made every year. There was frenetic baking starting after Thanksgiving and frenetic nibbling by me. I’ve been making her cookies for years, but I’ve decided to add some new ones to mom’s repertoire. Our son loves Almond Joy candy bars, so I know this is one he’ll never forget. I hope he has memories of home-made Christmas cookies like I do. This recipe is from Chef in Training. 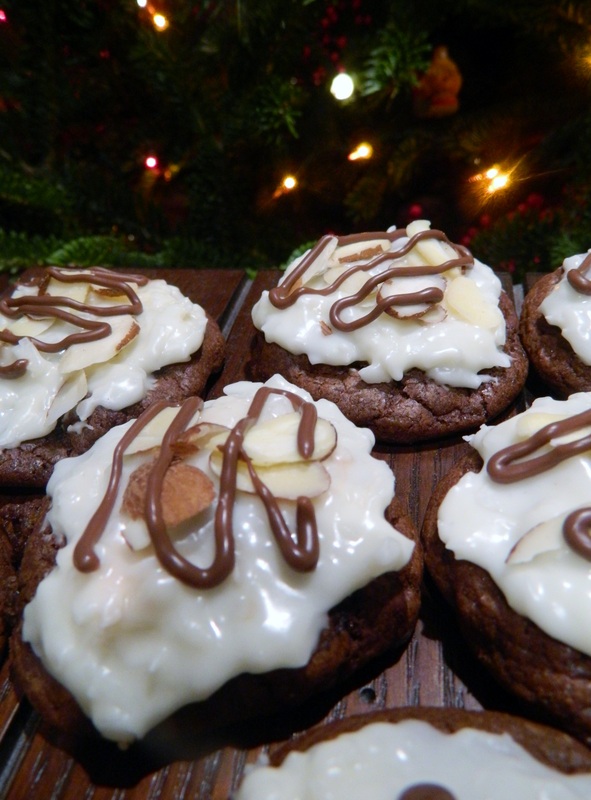 Check it out – Nikki has a long list of fun and yummy cookies. This one is a keeper. This chewy cookie has all the ingredients of the famous candy bar. Preheat oven to 350 degrees. Sift together flour and baking soda and set aside. In large bowl, cream butter and sugars. Add pudding package and beat until well blended. Add eggs, vanilla and almond extract and beat until well incorporated. Add flour mixture slowly until well incorporated. Stir in chocolate chips. Roll into one-inch balls and place on greased baking sheet. Bake at 350 degrees for 8-12 minutes. Cool cookies before icing. In a medium saucepan, add evaporated milk and sugar and bring to a boil being careful not to burn. Once it reaches a boil, remove from heat and stir in marshmallows until melted. You can keep the heat on low until the marshmallows are melted. Once marshmallows are melted add coconut and stir. Add powdered sugar and beat until smooth. Frost cooled cookies with icing. Drizzle melted chocolate over the tops. I’ve been touching and studying Gran’s dishes for decades – running my fingers over the hand-painted raised, pink flowers. Many solitary hours of my childhood were spent exploring the china cabinet and any nooks with pretty clutter. I organized and rearranged dishes, silver, china, Carnival glass, and more. Gran’s dishes were the ones I loved because mom loved them. 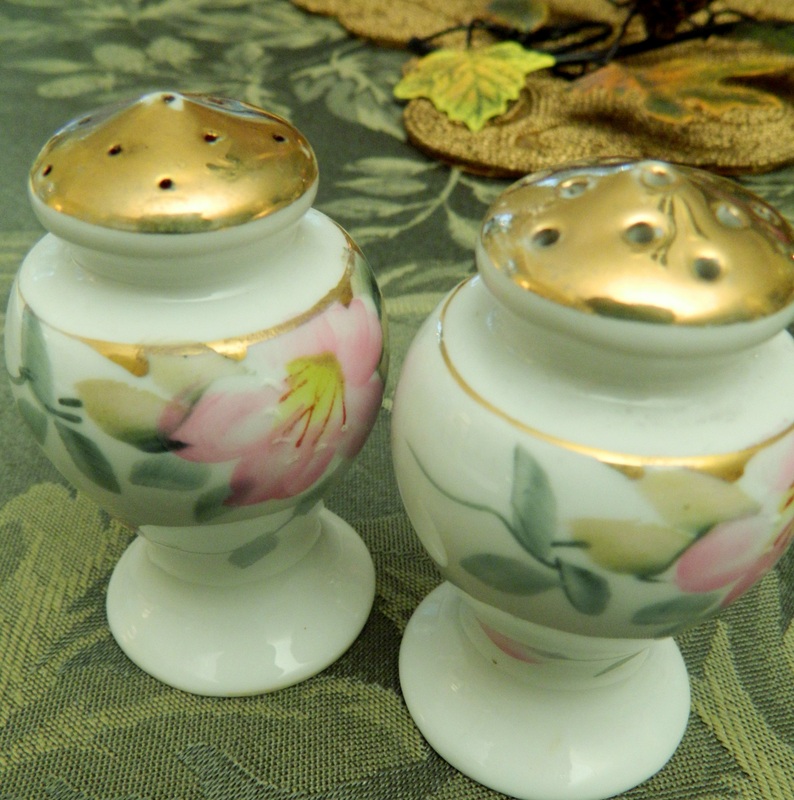 She searched antique shows and shops to find matching pieces. Back then there was no Internet for quick searches and free shipping. I remember her excitement when she came home with another piece. Victory! But she never used them. Why? Maybe because there was only service for six. Or maybe they were just too precious, something you “saved for good.” That was the way a lot of Depression-era folks thought…save the good stuff, you might not get it again. 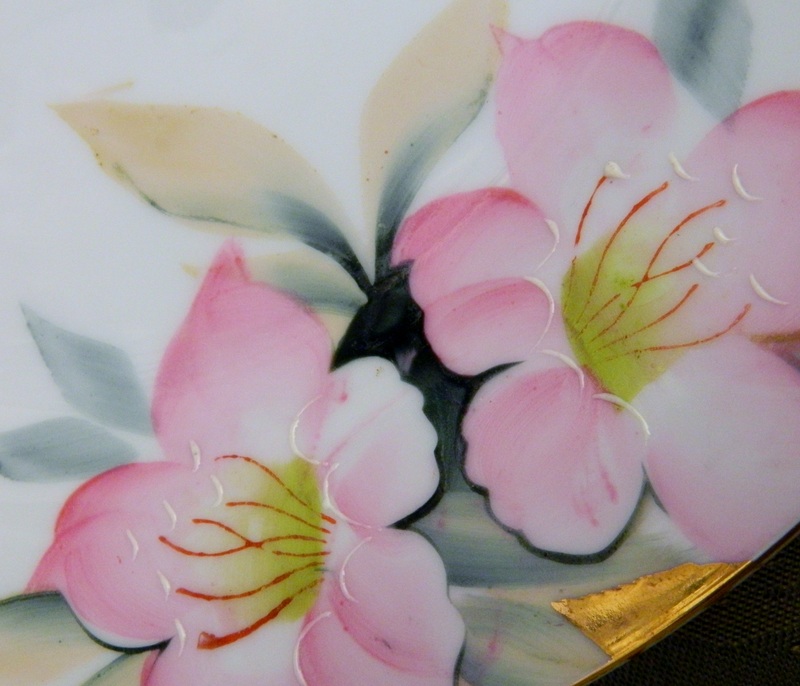 Gran’s dishes are Noritake’s Azalea pattern, hand-painted with gold trim. Because of the stamp on the back, this particular pattern was manufactured pre-World War II in Japan in the original factory owned by Ichizaemon Morimura. Mom gave me those dishes. I never asked for them, she just knew. I’ve never used them until this year. This Thanksgiving there were only six of us so I had enough plates. 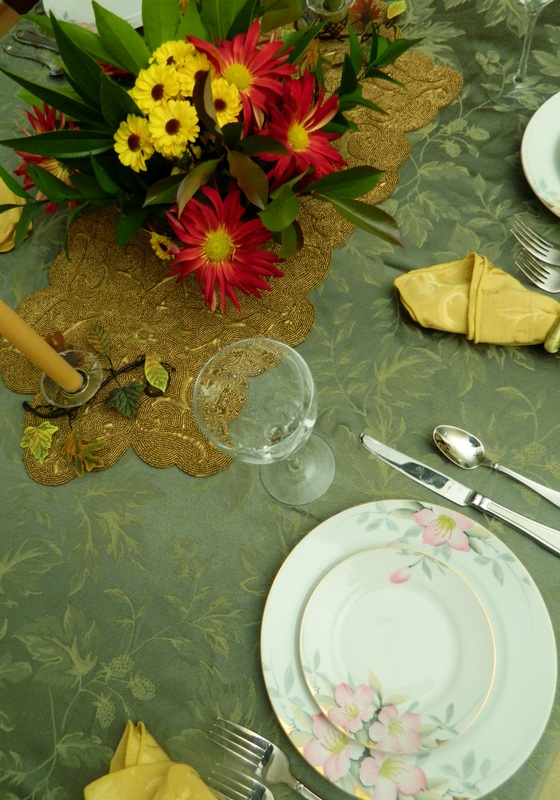 Instead of my usual go-all-out tablescape, I kept it simple…simply Gran. The moral of the story: use that stuff you were saving for good. The good is now. Lucy…Don’t Try This at Home! Today, December 13, is St. Lucy’s Day or Santa Lucia Day. The day is celebrated in Norway and Sweden when girls dress in white dresses with red sashes and wear wreaths of candles on their heads. (That’s the part not to try at home.) In the Julian calendar, December 13 marked the winter solstice and the candles gave light to the longest day of the year. Saint Lucy Day is also celebrated in Italy. Santa Lucia Buns, made with a rich, saffron dough, are the traditional treat for the day. 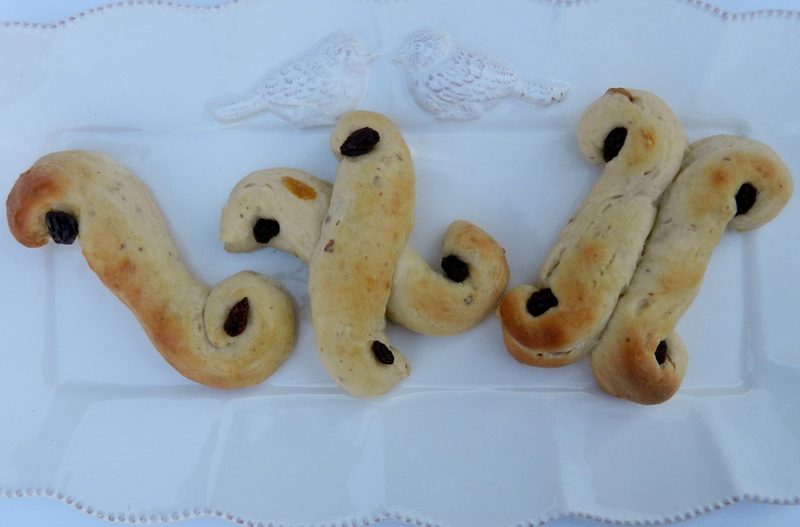 They’re fun to make, so gather the kids to help roll the dough and make the whimsical twists. You might have a new Christmas tradition….and lots of memories. Heat the cream just until hot but not boiling in a saucepan. Remove from heat. Add the sugar, butter, saffron, and salt and stir until the butter is melted. Let cool to room temperature. Stir the yeast into the warm water in a large mixing bowl. Let stand until foamy, about five minutes. Stir the cream mixture into the dissolved yeast. Using a wooden spoon, stir in 2-1/2 cups of the flour; beat until smooth. Beat in 2 eggs, the golden raisins, and ground almonds. Gradually incorporate the remaining flour, first stirring with the spoon and then mixing with your hands. The dough will be fairly soft. Turn the dough out onto a lightly-floured surface and knead until smooth and elastic, 5 to 10 minutes. Place the dough in a large buttered bowl and turn to coat with butter. Let rise, covered with a damp towel, in a warm place until doubled in bulk, about 1-1/2 hours. Punch the dough down and place on a lightly-floured surface. Cut into 20 pieces. Roll the dough into ropes on a work surface and shape on greased cookie sheets in any of the ways that follow below. Cover the buns with a damp towel and let rise until doubled in bulk, about 45 minutes. Just before baking, brush the buns with the egg-white wash.
Bake until golden brown, 12 to 15 minutes. Remove to wire racks to cool. Serve warm or at room temperature with plenty of butter. Wagon Wheels: Roll two pieces of dough into 10-inch ropes, one-half inch wide. Place the two strips side by side on the cookie sheet. Pinch all but the ends together and coil each of the four ends as in the photo (right). Press a dark raisin in the center of each coil. Santa Twists: Roll one slightly smaller piece of dough into an eight-inch rope, one-half inch wide. Coil the ends in the opposite direction, making an S that resembles the photo (left). Santa Lucia Buns: Roll two pieces of dough into 10-inch ropes, one-half inch wide. Make an X with the ropes. Coil each end counterclockwise to resemble the diagram. Press a dark raisin in the center of each coil (center photo). We blog, text, and email our recipes to family and friends. But, there’s nothing like a hand-written recipe. Mom didn’t have a computer way back when. 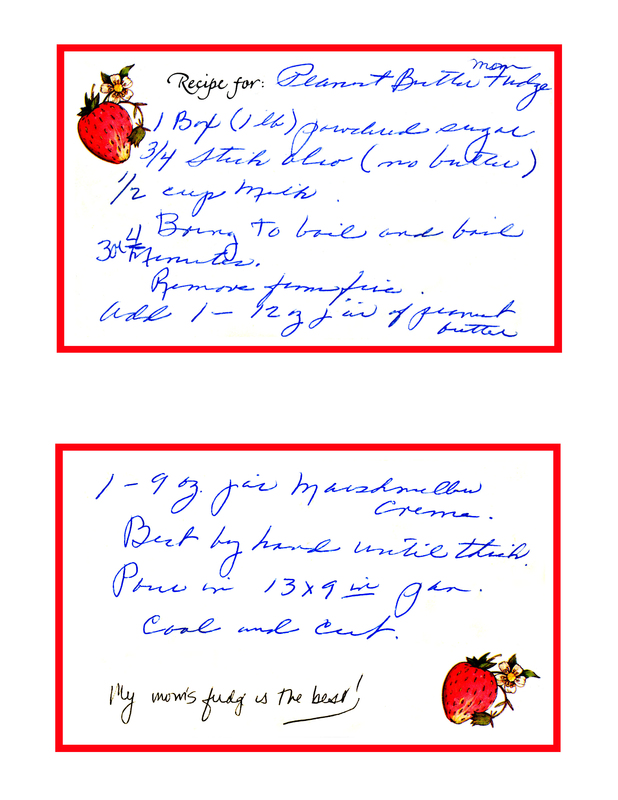 She used pretty little recipe cards with her unique and familiar cursive. The Internet has made finding recipes easy and quick. But, take the time to write some of your family favorites down on paper for your kids…in your own handwriting. It’s all part of the memory. 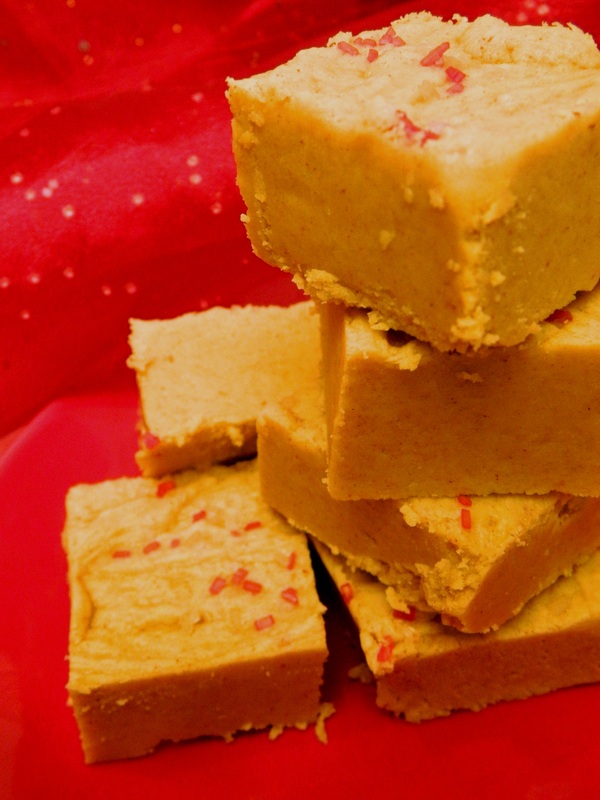 I just made mom’s fudge from her well-worn recipe card. She made it every year at Christmas. Her directions are vague and the jar sizes don’t exist anymore. But I get it as close as I can every Christmas season. A Family Christmas Gift to Cherish: Scan a cherished, hand-written family recipe and print it on iron-on transfer paper for fabric. (Available from Michaels, Walmart and craft stores.) Follow the directions on the package to iron on your family recipe on an apron. Plain colored aprons can be purchased at Bed, Bath and Beyond and similar stores. In saucepan, mix confectioner’s sugar, margarine and milk. Cook and stir for about 6-1/2 minutes until it boils. It should be at the candy soft ball stage. Add peanut butter and marshmallow cream. Beat by hand, Pour into square pan. Cool and cut.